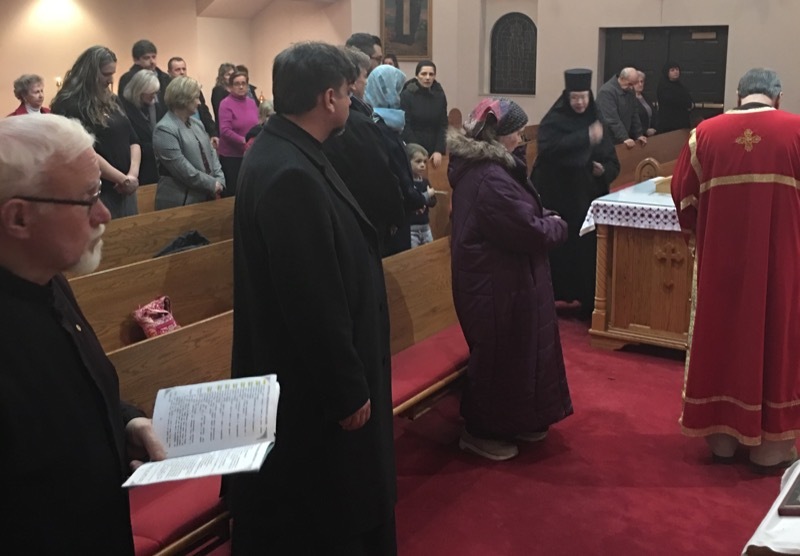 With the blessing of His Grace Bishop Irinej, priests from around the Cleveland Deanery gathered to celebrate the Liturgy of Presanctified Gifts on Friday, March 10th at St. Demetrius in Fairlawn, Ohio. The parish filled with faithful from many different parishes as Fr. Milan Pajic, parish priest of St. Archangel Michael in Akron, and Fr. Aleksa Pavichevich, parish priest of St. George in North Canton, served together with great solemnity. The host-priest from St. Demetrius, Fr. Dragan Goronjic, Dean of the Cleveland Deanery, led a group of chanters, which included visiting clergy from St. Sava Serbian Orthodox Church in Broadview Heights, Fr. Mioljub Matic and Fr. Protodeacon Ljubisa Mitrovic. Non-serving clergy present included Fr. Sava (Medakovic) and Fr. Djordje Mileusinic, retired parish priest of St. Demetrius. Immediately following services, faithful gathered in the parish hall to partake of a wonderful Lenten meal prepared by the St. Demetrius community.